Two Summers by Aimee Friedman is a Sliding Doors-esque confection that is indeed perfect for summertime reading. The stakes are just high enough for you to want to keep reading, but this is not a nail biter. Two Summers is about one teen girl named Summer--naturally--and the two parallel journeys she takes. What if you chose not to take an important phone call and get on the plane and your life took a different path? For me, it was a little hard to empathize with Summer's discomfort in France for the simple reason that she gets to spend an all expenses paid trip to Provence for the summer! It's a fairy tale situation of a teenager's dreams, as she is allowed complete freedom and along the way meets a cute and flirtatious French boy. The summer adventure spent in the States is less romantic but still edifying. Summer has always seen herself as lacking the artistic talent that her painter father has, but she has the opportunity to develop and recognize her abilities as a photographer. In both versions she learns a devastating family truth, one that could very well destroy her relationship with her father. Two Summers is an uncomplicated and leisurely summer read appropriate for younger teens. One of the things we notice when displaying LGBTQ children's and young adult books is the near absence of biographies of out LGBTQ individuals. The erasure of the history and lives of the LGBTQ community reveals an indifference to these experiences and the stigma of visibility. Like the picture book I am Jazz, Being Jazz: My Life as a (Transgender) Teenager by Jazz Jennings is groundbreaking, being one of the few nonfiction books written for young people about being transgender. Jennings has known she was transgender as long as she can remember. She officially lived as a girl starting at six years old and is fortunate to have a supportive family. She describes her experience with teenage depression and antidepressants, but the book is mostly very uplifting and accessible, from the joyful front and back cover images to Jennings' vivacious personality and the abundance of photos in the book. The parentheses in the book's title suggest that Jennings is a regular teen, that being trans doesn't make her life unrelatable to cisgender teens. However, she clearly has pride in her identity; at the Philadelphia Trans-Health Conference she said that she'd rather be trans than a cisgender girl. The fortitude of the Jennings family is impressive. They navigated hostile and ignorant schools and sports teams and media attention, all the while creating the scaffolding for Jazz to safely be herself. Being Jazz is an inspirational memoir that any teen can learn from and that transgender teens and families will cherish. The back matter includes an extensive Q & A with the members of her family and LGBTQ resources for youth and families. 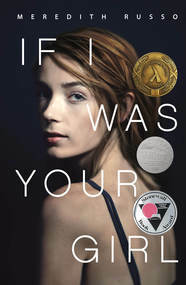 If I Was Your Girl by first time author Meredith Russo is a book written by a transwoman about a transgirl and featuring a transgender cover model. For such a groundbreaking YA book, the story is pretty rote. The background and the content of the book make it capital-I Important; however, the story is a conventionally told fish out of water romance. Happily, Russo educates her reader on trans etiquette without being too awkwardly didactic. Trans issues also bring up feminist issues. As it is with cis women, safety is an important issue for transpeople. As Russo says, "Being a girl in this world means being afraid. That fear�ll keep you safe. It�ll keep you alive." Amanda Hardy has moved in with her dad to Lambertville, Tennesse, where she's never visited before, to escape the dangers of her life in Georgia. In her transition from male to female, she suffered an assault and now that she is living as a girl, she moves away from her mom, seeking safety and anonymity. Amanda's anxiety is palpable and real, but as a character she's a little too good to be true. She's beautiful and passes easily as a girl. She is deferential and sweet and gets along well with her classmates. Russo explains this in a note from the author. She wanted the book to be as palatable and relatable to as many readers as possible. "I have, in some ways, cleaved to stereotypes and even bent rules to make Amanda's trans-ness as unchallenging to normative assumptions as possible." I was disappointed by some things that happen in the story, though relieved by other revelations. Without giving away too much, girls get an opportunity to be heroic. If I Was Your Girl is well worth reading and is another important accomplishment in the creation of a well rounded canon of LGBTQI teen literature.